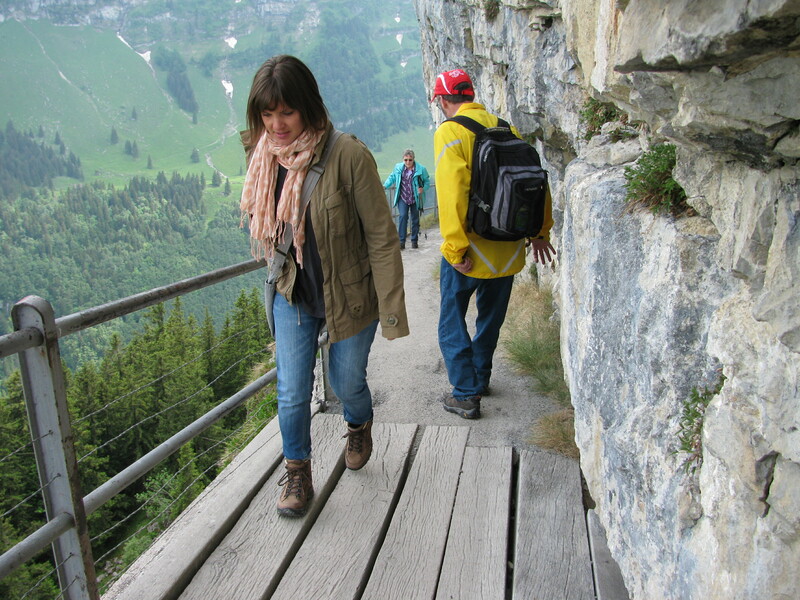 Our gondola did not plummet to the earth and so with my worst fears unrealized, we got off the gondola and were rewarded with a fabulous view over Appenzell’s picturesque valley. 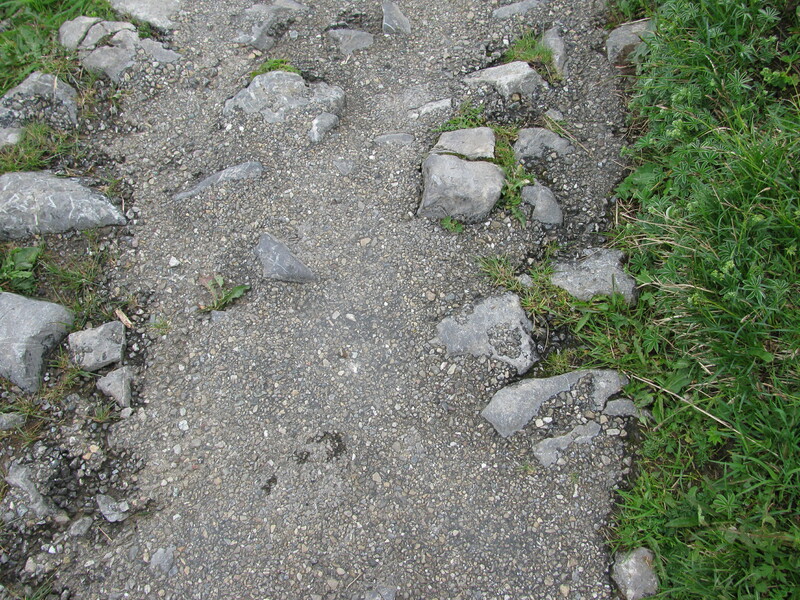 Uneven path surface strewn with cantaloupe-sized rocks to weed out the weak. In case the random rocks don't trip you up, the Swiss imbed steel bars. "That will fix them," say the Swiss. 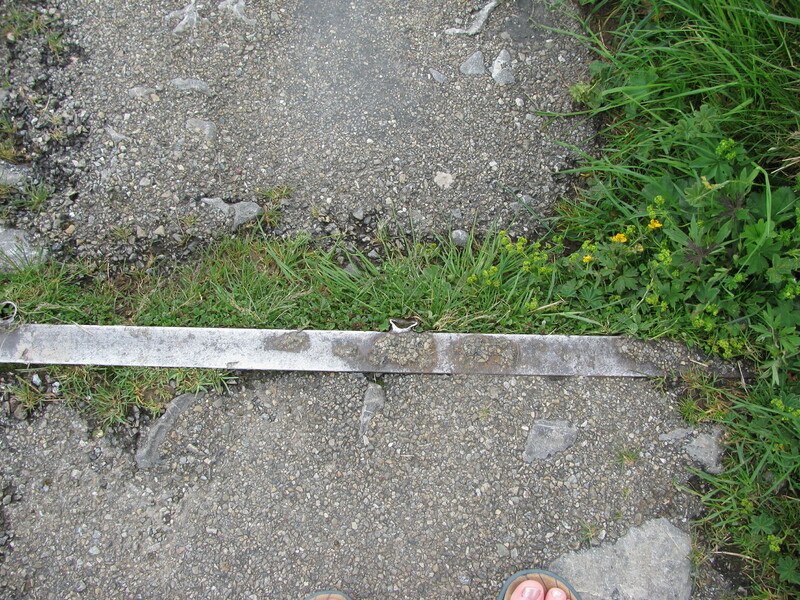 We walked over some very uneven mixed asphalt/stone/steel bar path, so we could barely take our eyes off our feet for fear of falling. To the Swiss, this was probably a bonus feature. To the rest of us, it was disconcerting. 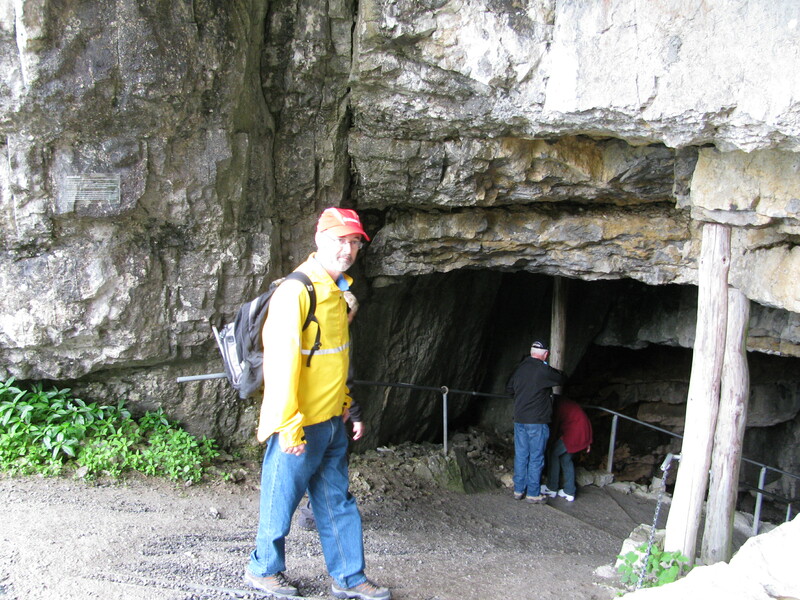 After a short steep walk we arrived at the massive mouth of a cave that spiraled down into the mountain. 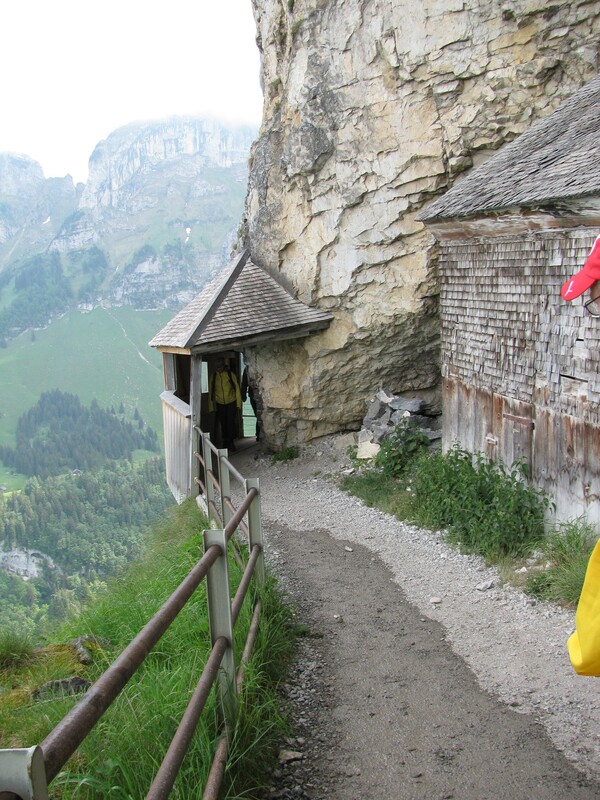 Clinging onto the railing (the trail is wet, steep and poorly lit), we arrived at the hermit’s cabin made of sturdy timbers with rough cobblestone floors. It was a meditative place, but not for long. I opened a door to get outside and the door made such a grinding screech that a bunch of Swiss leapt up in terror that the giant bear skeleton (on display inside the cabin) had come to life. At least, that is what they told me. 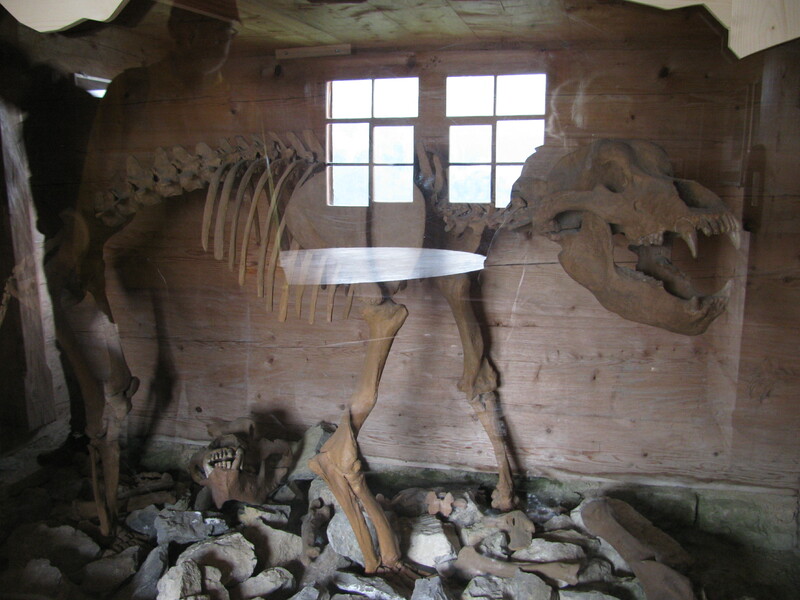 Bears (real skeleton) once inhabited the cave at Ebenalp. Later hermit monks lived here (1658 to 1853). 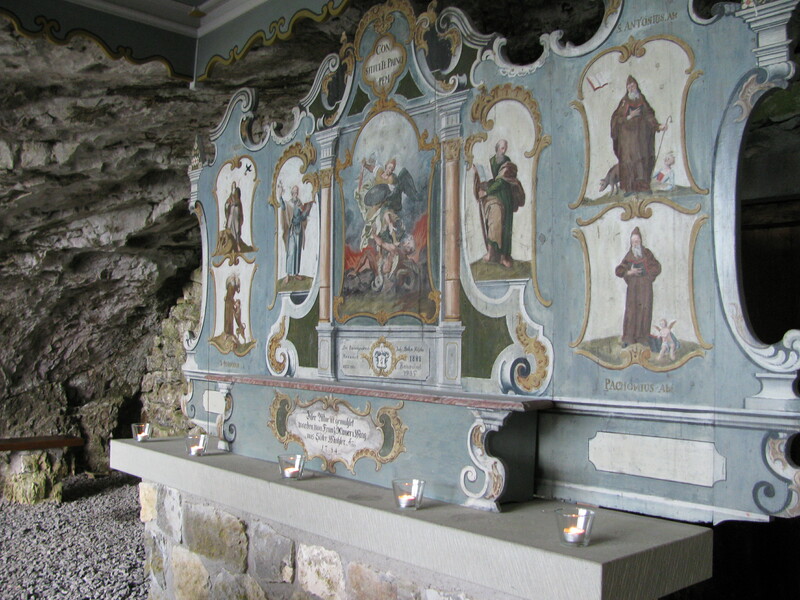 The 'wildkirsche' (church cave) nearby is 400 years old. It’s possible the door was not “meant” to be opened and it was the first time it was set ajar in maybe … I don’t know, a couple of years, but there were no posted signs reading “verboten,” so I just shrugged and left the Swiss to perform CPR on one another. 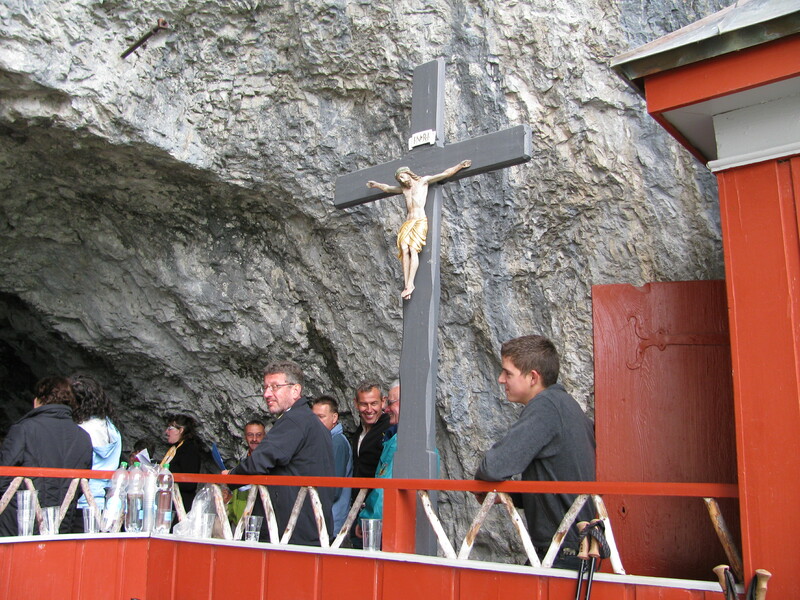 We resumed the trail walk, which was now just a narrow goat path on the mountainside, and came upon a second cave, the church (Wilderkirsche) where a wedding was underway. We captured a wonderful moment when a small a capella choir gathered and started singing – the stone acoustics sending their crisp voices out over the valley below. It was lovely, although I’m not sure the wedding couple was so thrilled to see us. 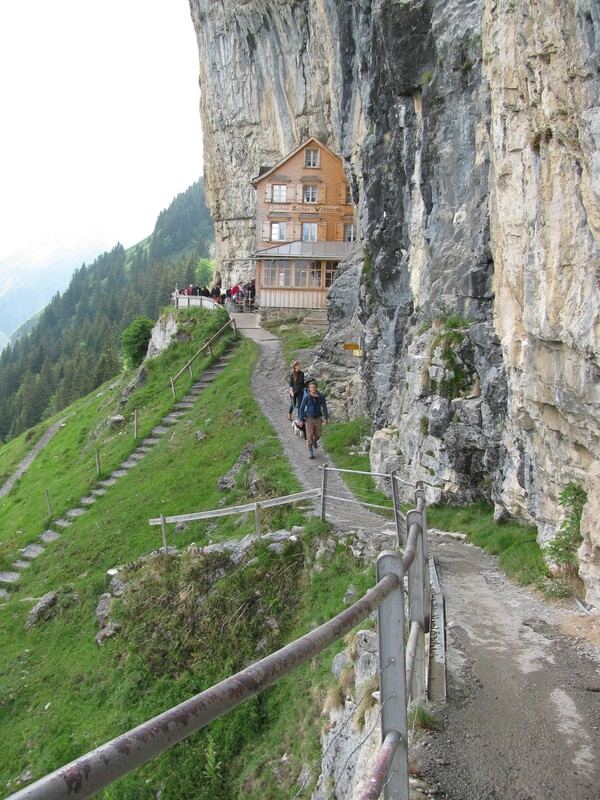 We then walked a narrower path to Ebenalp guest house, which is built underneath a walloping rock overhang, and does not look like the kind of place anyone would want to be sleeping in should an earthquake start up. Half of the patio tables were soaking wet from ground water dripping from the overhang, but we managed to squeeze in with a friendly rugged crowd of hikers, one of whom may have mistaken me for someone else when I said, “Why helloooo Sweetheart,” but then relaxed when he saw I was talking to his white German Shepherd who was sprawled out between the crowded tables. 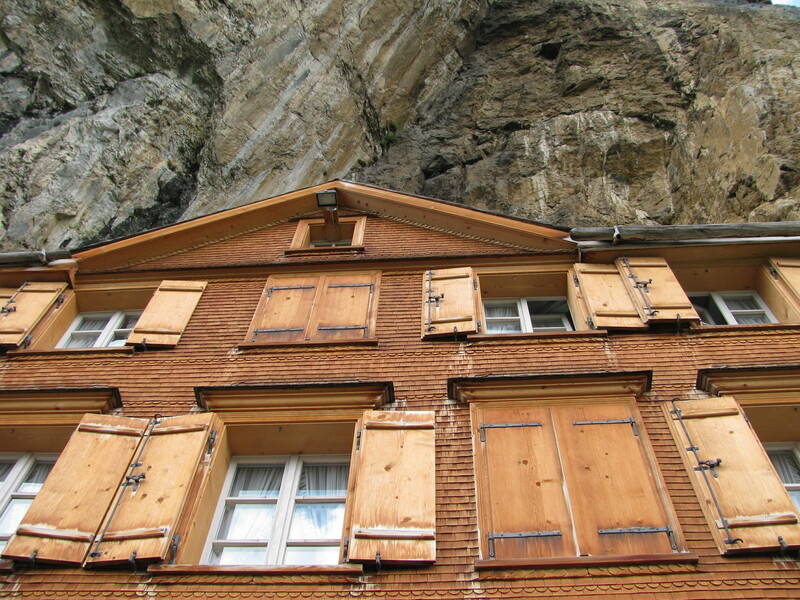 It's not just the camera angle - that huge hunk of rock overhangs the 170-year-old Berggasthaus Aescher, an inn that once housed pilgrims seeking spiritual guidance from the mountain's Catholic monks and now serves as a guest house for hikers. I felt it best to say something endearing to the dog as I would have to step over him to get to one of the few dry empty seats left on the patio. I wanted him to understand that we could be friends. He did, and let us pass without sinking his massive jaws into our shins. What a relief. This post is already too long, but I will add that Dave ordered soup, which came with two hotdogs in it. He gave the soup the thumb’s down – it was thin, watery and not very flavorful. But this was all last weekend – today we are in France’s Franche-Comte region checking out some elaborate stone architecture the Spanish built here when they were in charge of the place – yes, the Spanish messed up France. The more we learn about Europe’s small places, the more we realize how its national borders have wiggled around under the pressure of conquest…suggesting that medieval Europe was not too far removed from modern-day Palestine/Israel’s border argument. More about France later. 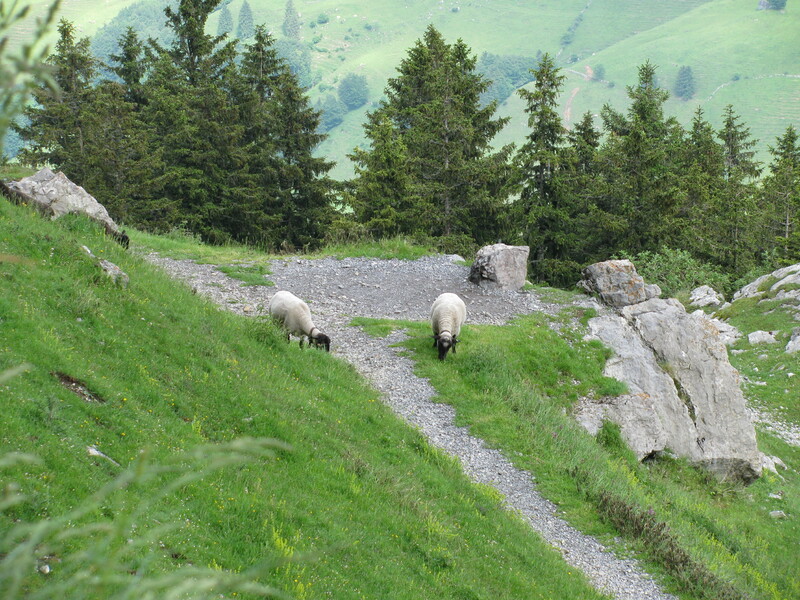 In the meantime, here are some remaining shots of Appenzellerland. This was not Switzerland's finest cuisine hour. Fearless Swiss build into the side of the mountain. Dave inspects cave timber supports. Not really confident these toothpicks can keep mountain from collapsing on us. Shrugs shoulders. Continues inside. Yes, it's a little steep. Why do you ask? 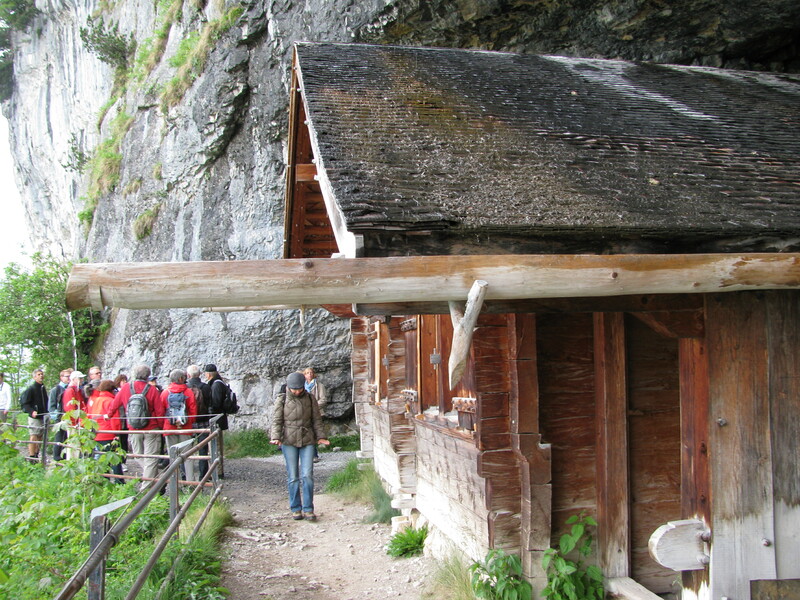 Hermits cabin at Ebenalp, built right into cave. This would never pass code. You wouldn't think a path so skinny it needs a boardwalk to bridge the gaps would be so crowded. Awww, sheep. They were grazing just below the restaurant. Wilderkirsche - once again, the Catholics get there first and get the better church location. 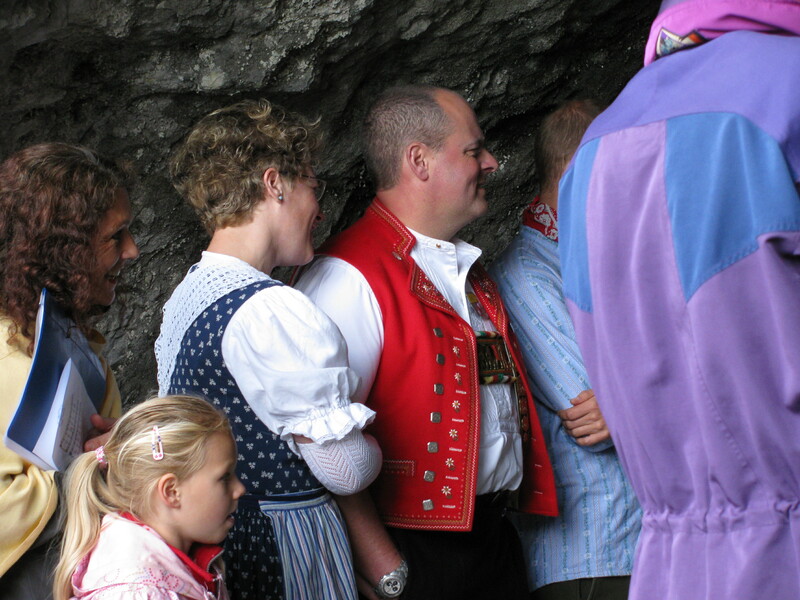 Wedding guests dressed in proper wedding traditional Swiss attire. 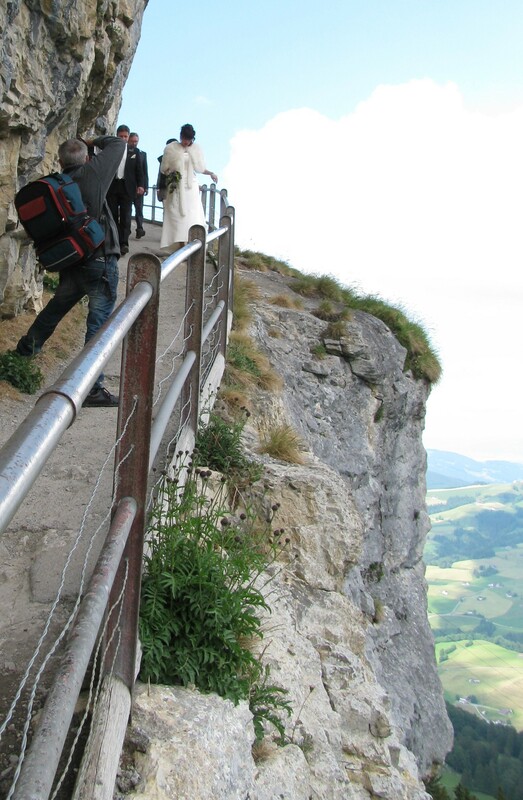 The newlyweds head down from the cave church to the inn for their wedding feast, which will be held under a megatonnage of overhanging rock. If their relationship can handle this stress, they will be okay. What's this? Is the bride changing her mind and bolting back up the mountain? Or just avoiding pesky wedding crashers (ie. us, who were on our way back from lunch at the inn). I thought it said mustard on the tube, what colour was the contents? Is that oscar the grouch on the lid of the creamer beside Dave’s soup? And is that mustard in the tube? I am enjoying my arm chair travels with you. We too were post wedding crashers the last time we were in Banff, we came upon a couple trying to getting their wedding pictures taken without random people walking into the shot. You’re right. It is mustard. Thomy also makes mayonnaise and I assumed this was a tube of the same (the label colours seemed more mayonnaise-like – blame Hellman’s and Kraft), so I told Dave it was mayo. He never opened it. Good eye, Ann!